It's become a rite of passage for any major smartphone -- a few hours under the knife (read: dozuki saw! ), for the good 'ol iFixit teardown. Today's victim is the Motorola Droid RAZR, which happened to hit Verizon stores around the time it arrived at the iFixit labs -- so, yes, you can go pick one up today and do this yourself at home, at your own risk and $299 expense, of course. The teardown revealed that most of the key components are on one side of the motherboard, where you'll find the Toshiba THGBM4G7D2GBAIE 16GB EMMC flash memory module, Samsung K3PE7E700M-XGC1 4GB LPDDR2 RAM, Qualcomm MDM6600 dual-mode baseband/RF transceiver, Motorola T6VP0XBG-0001 LTE processor and other goodies like the combo Bluetooth/WiFi/GPS receiver. Wondering what else Motorola was able to pack neatly below that 4.3-inch qHD Super AMOLED display? Hit up the source link for the full iFixit teardown. 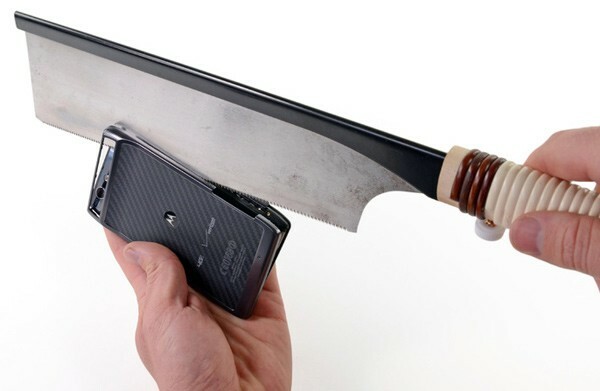 Motorola Droid RAZR hits Verizon stores, iFixit labs originally appeared on Engadget on Fri, 11 Nov 2011 11:43:00 EDT. Please see our terms for use of feeds.